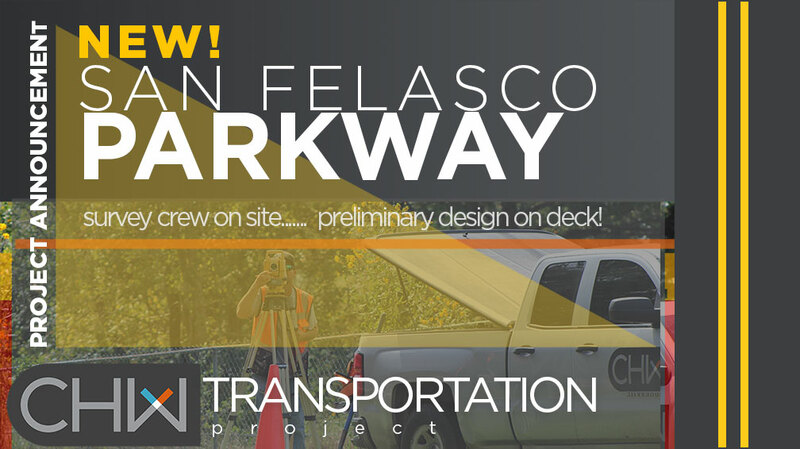 Alachua / Greater Gainesville, FL – The design of the City of Alachua’s NEW San Felasco Parkway project is underway. CHW’s Transportation Engineering + Public Projects team kicked-off Preliminary Design and CHW Land Surveyor crews are onsite collecting field data! San Felasco Parkway’s planned future route will connect County Road (CR) 241 to NW 43rd Street as a parallel roadway facility to US 441. Phase 1 of the Parkway will be 1.4 miles long and connect CR 241 to the south side of Progress Park. The roadway will be a landscaped thoroughfare that includes necessary roadway and utility infrastructure to support economic development. The City of Alachua was awarded a $6.75 Million dollar Florida Job Growth Grant by the Governor’s office to construct the parkway and infrastructure. The new roadway will serve the nearly 250-acre undeveloped Corporate Park. The project is the catalyst to attract, grow and retain businesses that will facilitate the continued growth and prosperity of the Good Life Community. CHW is providing land surveying, civil and traffic engineering design, lighting design, landscape architecture, and construction administration services. The design is planned to be completed by Spring of 2019 and construction of phase 1 of the parkway complete by summer of 2020.